Getting to model Tarantula Clothing for this photoshoot was a thrill!! If you are new to the brand or maybe not yet familiar with Tarantula Clothing, let me fill you in. Tarantula Clothing is all about quality, quality, quality. Specializing in 1940s-1960s fashion styles, Tarantula Clothing is made in the USA and located in Los Angeles, California. Tarantula Clothing will keep all you Pinup Rockabilly dolls classy and sassy in their pinup, doo-wop, rockabilly, vintage, reproduction, and classic Hollywood film noir styled clothing, and, they also have a menswear line inspired by classic American fashion so the hubbys and fellas will be dapper, dashing and no doubt handsome. From cute Peter Pan colored tops, high-waisted trousers, to fashionable dresses, Tarantula Clothing will become a staple in your wardrobe. Tarantula Clothing even designs their clothing with a curvy women in mind with sizes ranging from XS – 2X. How fabulous is that!! 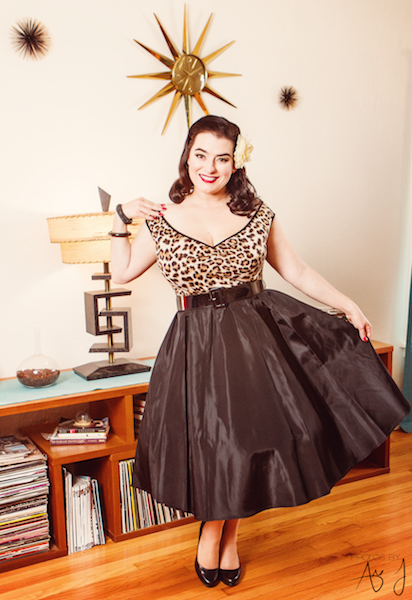 In these pictures I am wearing the Tarantula Clothing Hot Hostess Dress with Leopard Top and Black Taffeta Skirt. I am a curvy girl with G cups and this dress could not fit me any better!! The top is made from knit and therefore has a bit of stretch but yet still keeps it shape and it sits just a bit off the shoulder. The taffeta skirt couldn’t be anymore ladylike, feminine and fabulous. All I wanted to do was twirl twirl twirl. You’ll not only look stunningly gorgeous but you will feel every bit the Hot Hostess you are! This dress is perfect for hosting a cocktail party, dinner party and going out on the town in. Tarantula Clothing’s Hot Hostess dress also comes in red and black. Tarantula Clothing has you covered for work/office outfits or evening/weekend fashions that are made of top quality fabrics and designed beautifully with not only curvy girls in mind but the fellas too!! And, if you are looking for that perfect outfit to wear at Viva then hurry over to the Rocking Merch Shop while items are in stock, as they will sell out!! Shop all the fabulous Tarantula Clothing items and more at the Rocking Merch Shop.